Another great summer treat. Tomatoes and red pepper work really well together. 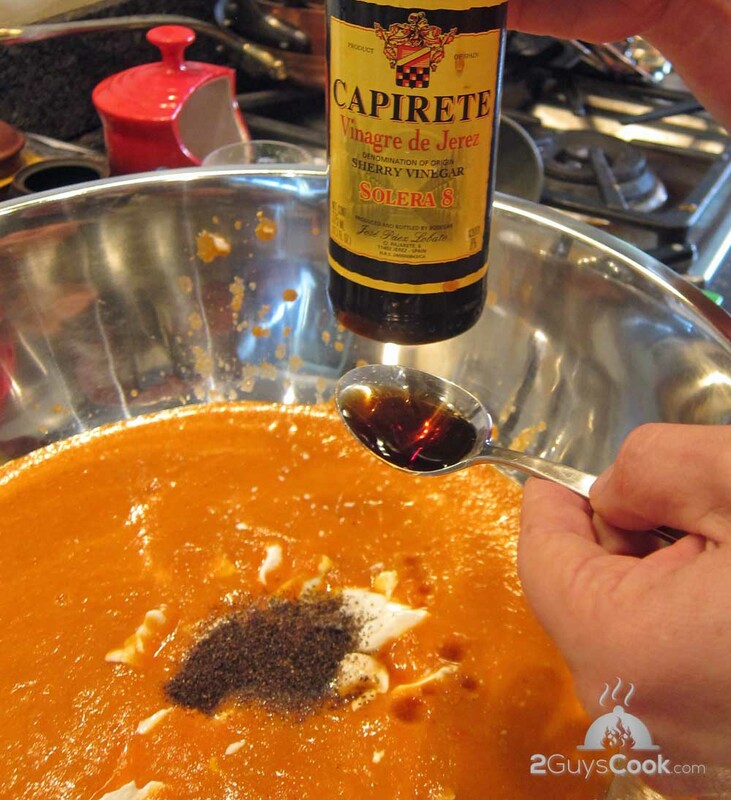 The sherry vinegar gives a hint of gazpacho-like flavour to the soup. Beside a tiny amount of oil and a little fat free yoghurt, this is another ‘free’ diet snack. 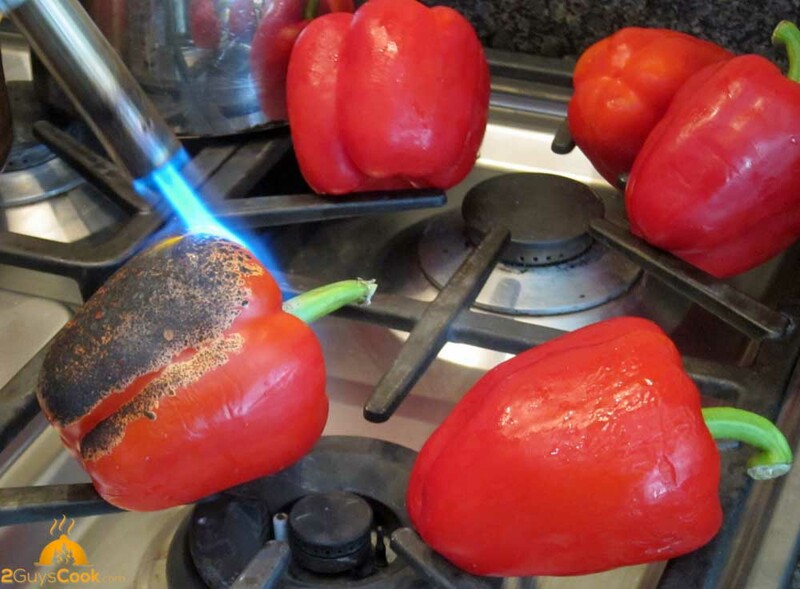 The skin from red peppers is removed by charring. 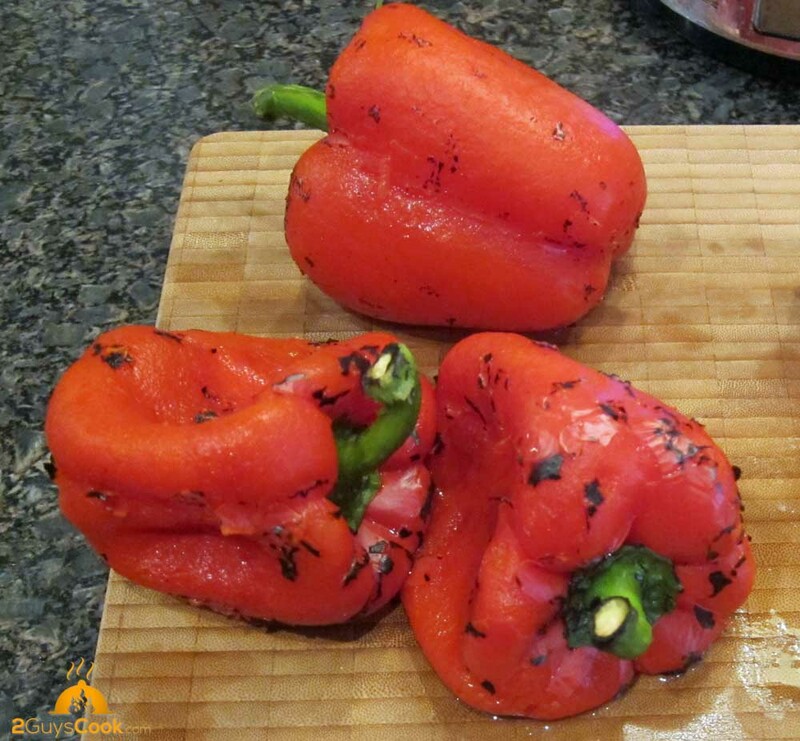 You can use a torch, place the peppers on a gas burner or cut in half and place under a broiler (not shown). Using a torch is very efficient but the skin is a little harder to remove. 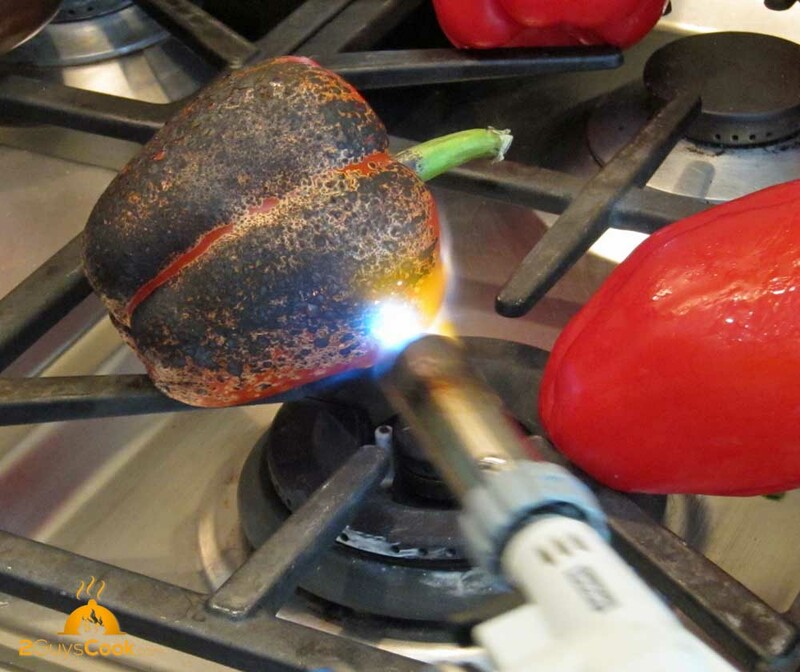 With the stovetop, the charring is not as complete. The charred skin is easy to remove but the uncharred skin is left behind. 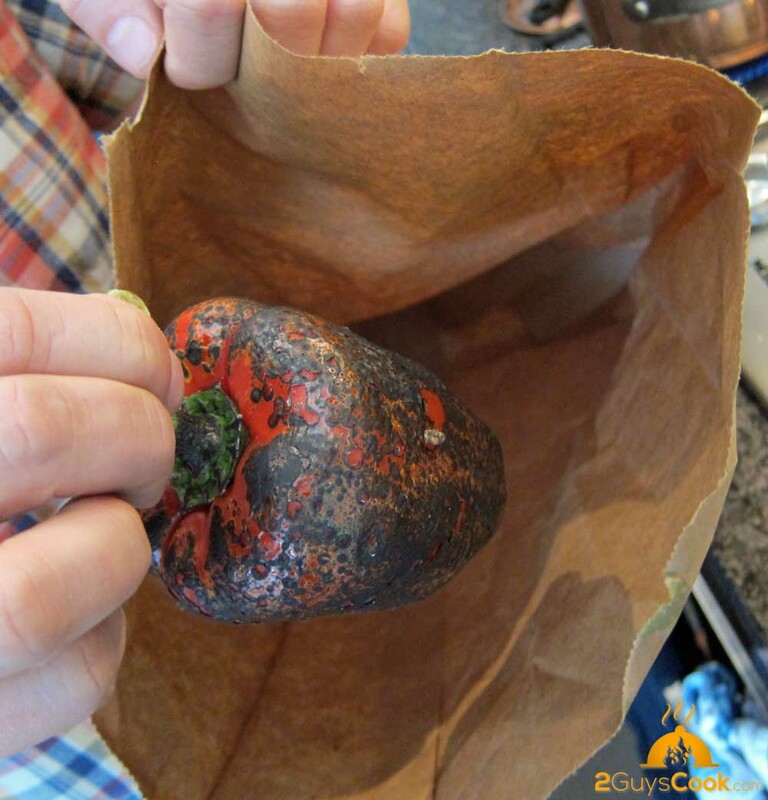 The charred peppers are placed in a plastic bag and left to cool (approximately 30 minutes). The skins are then rubbed off under running water. I don’t mind if a few charred bits remain, it adds a hint of smoky flavour. The peppers are then stemmed, deseeded and roughly chopped. 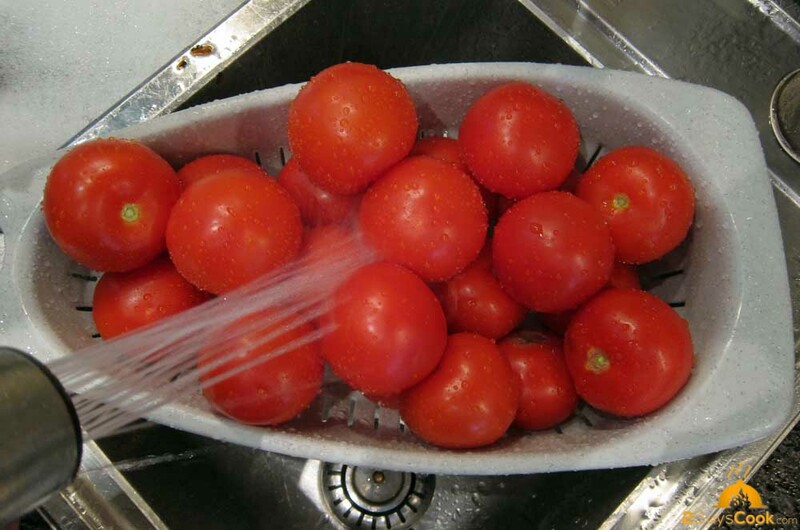 The tomatoes are washed and roughly cut. It is fine to leave the skin on – it is not detectable when the soup is finely pureed. Onions and garlic are cut, added to a large pot with some olive oil and salt and cooked until soft and translucent. The tomatoes are added and cooked until warmed through and are beginning to soften. The peppers are added and cooked for a few minutes. A little chopped parsley is stirred in and the mixture is allowed to cool. The cooled mixture is put into a blender and pureed. It is important to puree for a long time to make a very smooth mixture. 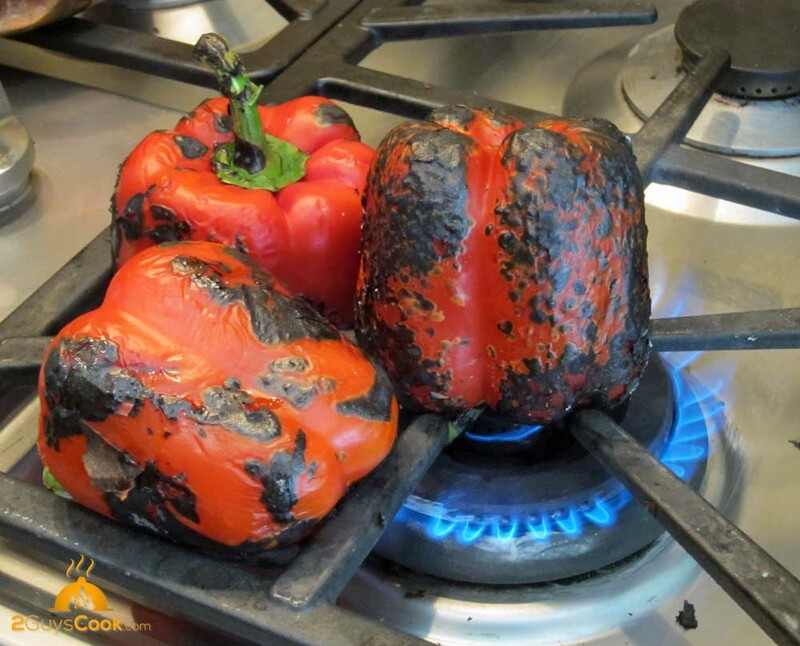 There were a few fragments of pepper skin (from the stove top peppers I think) that were left behind. If I was serving this to company I would put it through a coarse strainer (chinois) to give a smooth ‘mouthfeel’. A bit of fat free Greek yoghurt was added for richness. Salt and pepper are added to taste. (I added some Alder smoked salt to provide a smoky undertone to the soup – delicious!) A few tablespoons of sherry vinegar and a bit of hot sauce finish off the soup. This is a bit more work than most of the chilled soups I make but it is worth it. 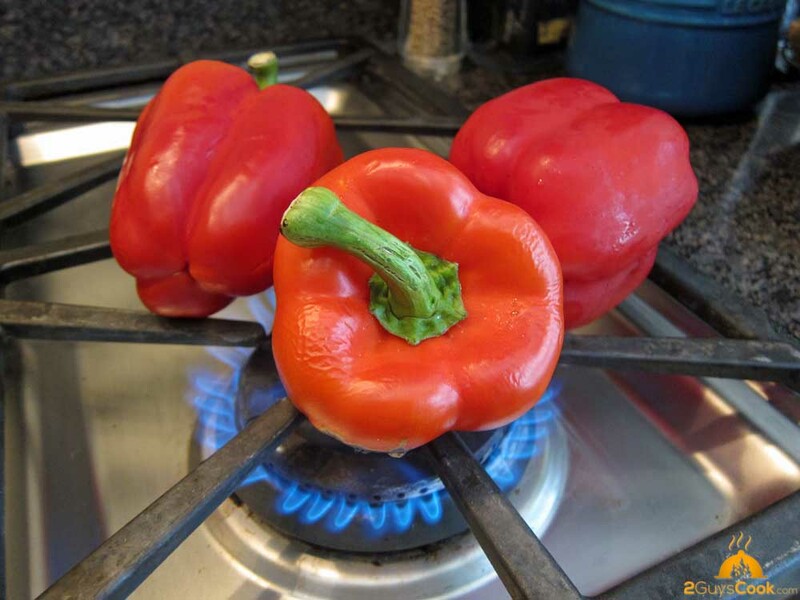 Peel peppers by charring the skin with a torch (2-3 minutes), on a gas burner (5-10 minutes) or by slicing in half and placing, skin side up, under a hot broiler (6 – 13 minutes). Place in a paper bag, seal and let cool. 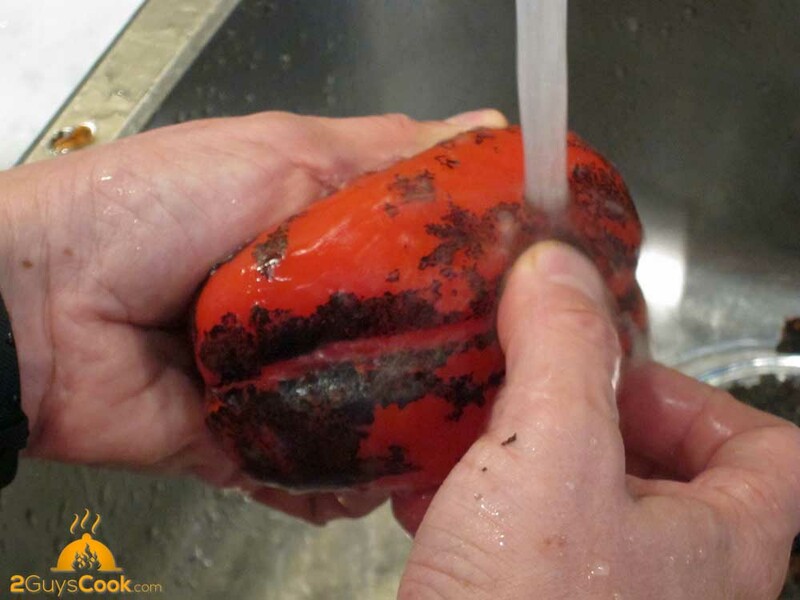 Run under cold water to remove the skins. Heat olive oil in a large pot and add onions, garlic and a little salt (to help draw the liquid from the vegetables). Cook on medium low heat until translucent and soft, approximately 10 minutes. 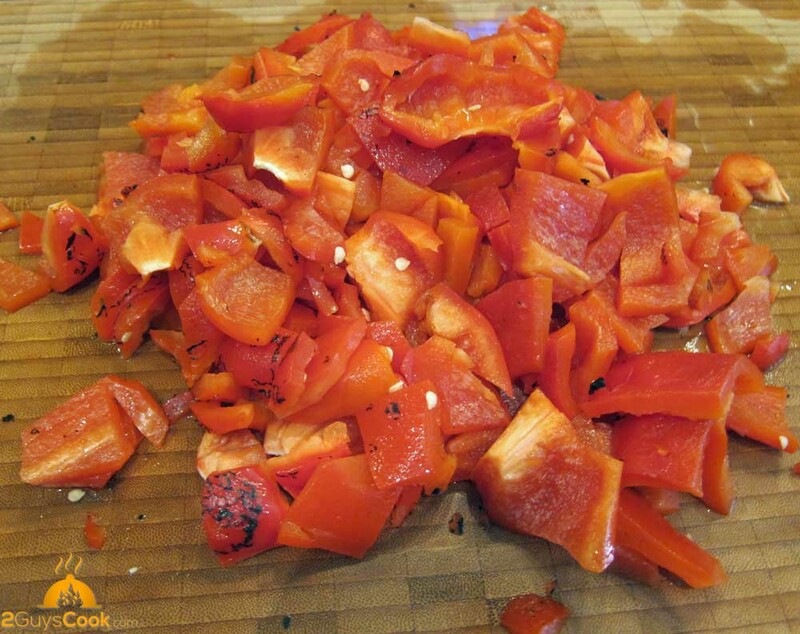 Add tomatoes and cook until beginning to soften then add peppers and cook for a few more minutes. (You are not trying to cook down the tomatoes as you would in a tomato sauce – you just want to soften them up to puree them). Add chopped parsley, stir and allow to cool. Place in a blender and puree very well – you want a nice smooth soup. Add yoghurt, vinegar, salt, pepper and adjust to taste.